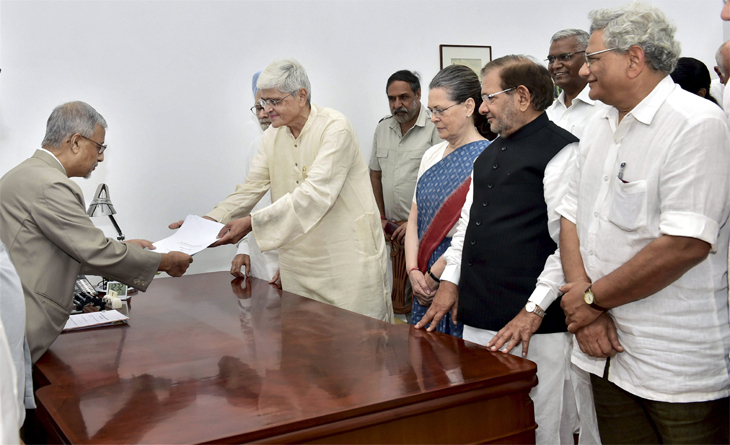 New Delhi, 18 July 2017 : Former West Bengal governor Gopal krishna Gandhi today filed his nomination for vice president in the presence of senior Congress and other opposition leaders, including from the JD(U). Gandhi has been picked by 18 opposition parties to be their nominee for the post of vice president. The Congress was represented by senior leaders such as president Sonia Gandhi, vice president Rahul Gandhi, former prime minister Manmohan Singh as well as Ghulam Nabi Azad and Mallikarjun Kharge as the former West Bengal governor filed his papers in the parliament complex. Also present were other opposition leaders, including JD (U)’s Sharad Yadav, CPI(M)’s Sitaram Yechury, CPI’s D Raja, NCP’s Tariq Anwar and Praful Patel, NC’s Farooq Abdullah and DMK’s Kanimozhi. The vice presidential is scheduled to be held on August 5. Gandhi will contest against the NDA’s candidate Ram Nath Kovind.